Highlight: "10-year rates [converging] with the Fed fund's rate ... shouldn't be a significant problem for the markets," @brianlevitt of @OppFunds says. 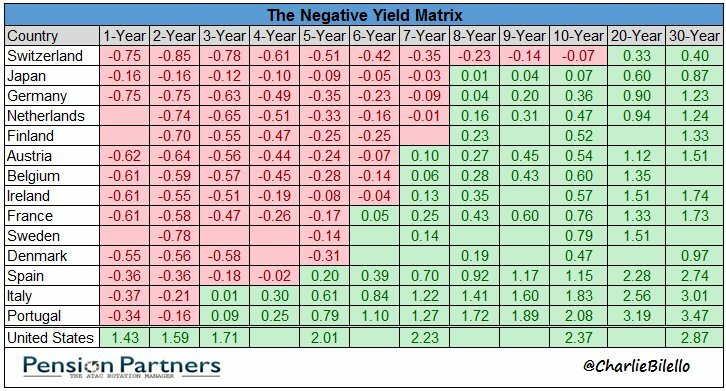 "The inverted yield curve is worrisome," Mona Mahajan adds but, "a lot of the globe has gone into negative yielding territory." 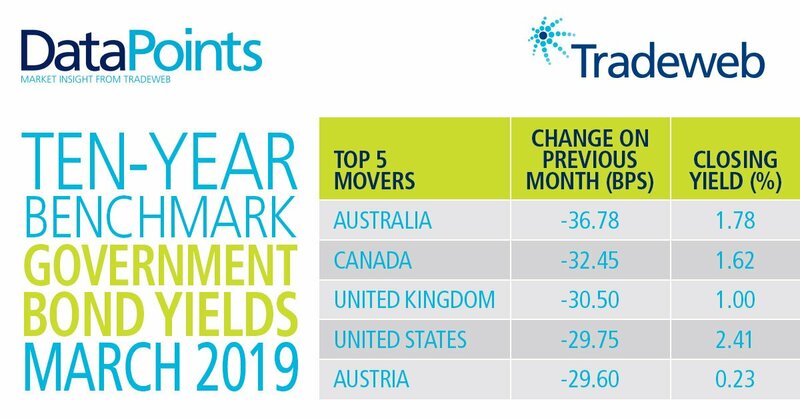 Highlight: Although the inverted yield curve can indicate a recession, "This time things are pretty different," Weeden & Co Chief Global Strategist Michael Purves says, "because I think [it's] going negative for a lot of reasons that have to do with structural disinflation." 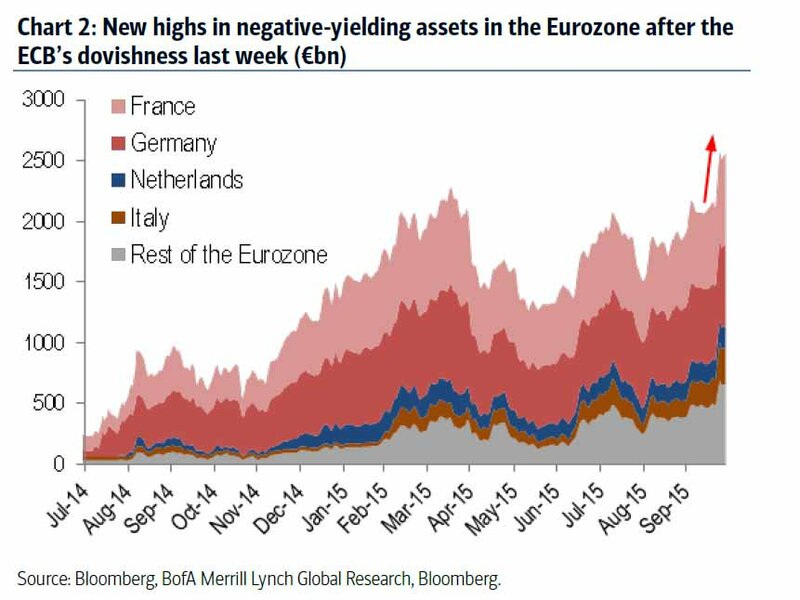 Capping off a month that saw the total pool of negative-yielding Eurozone government debt increase to EUR 3.3 trillion, Germany’s 10-year bond mid-yield entered negative territory for the first time since October 2016. Why? Maybe because trillions and trillions of global Central Bank debt monetization has completely deranged the price of everything? The #dollar index rises over the course of five trading sessions out of the last six, amid growing demand for defensive assets. 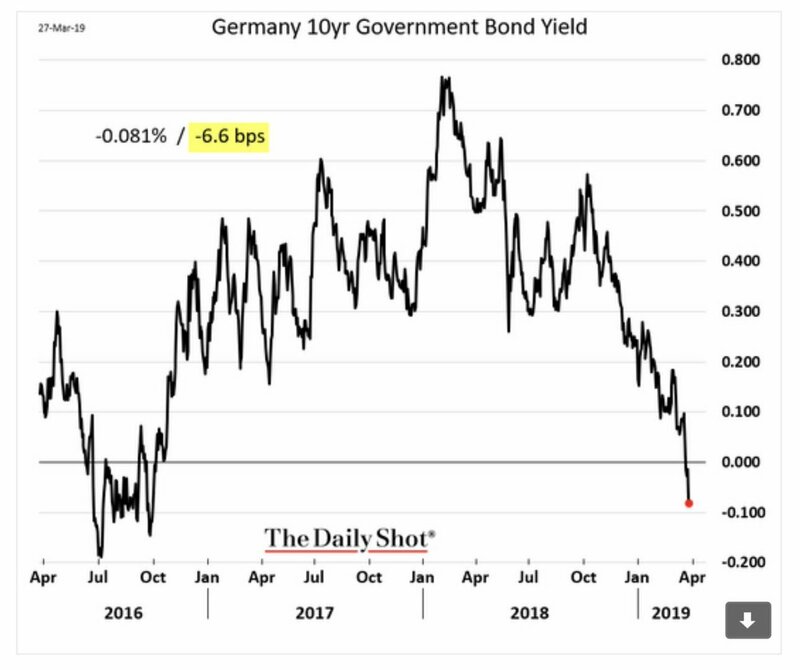 German and Japanese bond yields go deeper into negative territory, 10-year UST yields increasingly deeper below 3 months yield. A good yield compression morning to all. 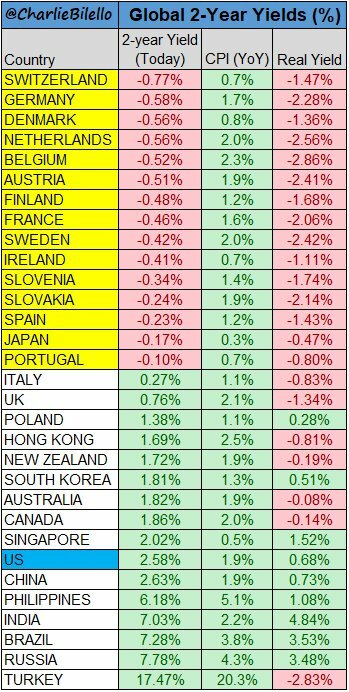 Global yields falling on risks to international outlook. 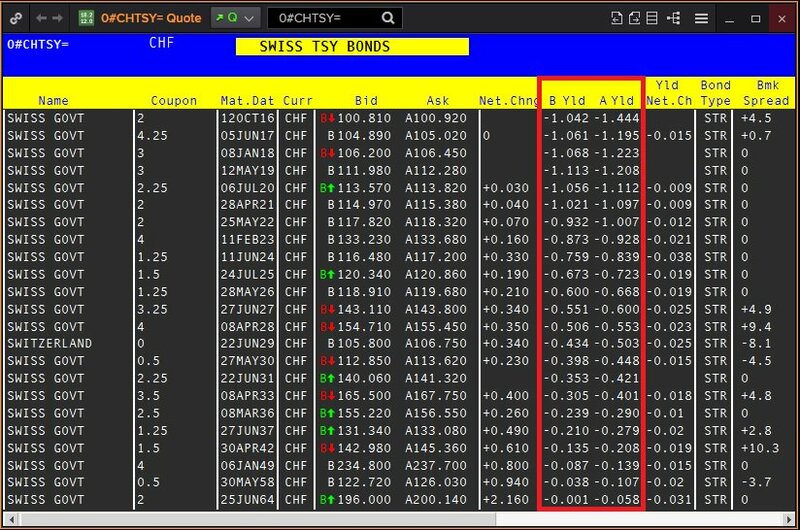 Yield on the Swiss twenty year goes negative temporarily overnight. A bad sign: the yield curve turned negative today for the 1st time since 2007. 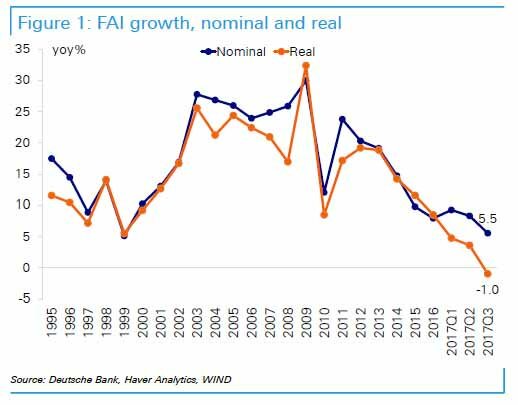 Inversions are reliable indicator of recessions. Analysts are watching this closely, and say it shows the market is worried about slowed growth. US 2-Year Treasury Yield hits 2.86%, its highest level since June 2008. 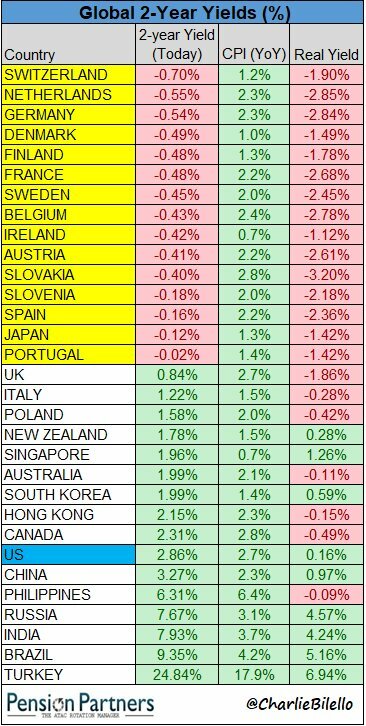 Meanwhile, 15 countries around the world still have negative 2-yr yields. Swiss 50-year yield falls below zero for the first time. 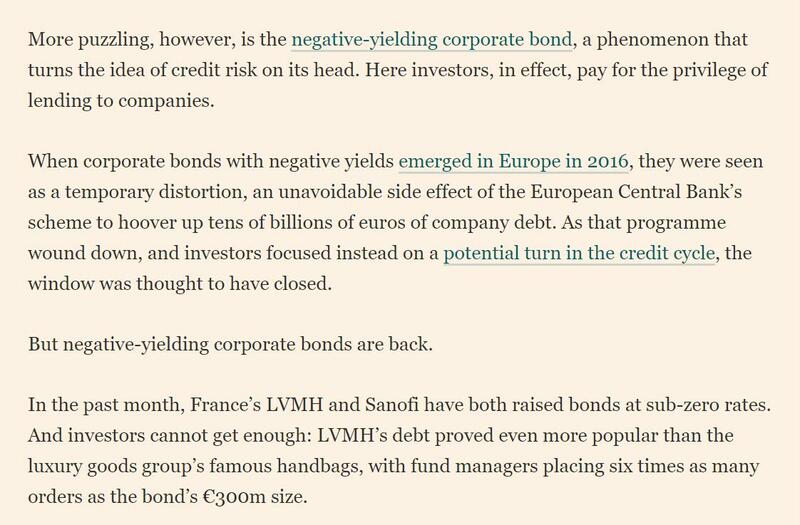 ALL Swiss bond yields are now negative.